Can You Eat Cheese Fondue While Pregnant? The French delicacy cheese fondue involves dipping bread into a little cauldron of hot melted cheese. Most hard and pasteurized cheeses present no safety problems for pregnant women. However, cheese fondue sometimes contains cheeses not suitable during pregnancy. It may involve re-heating cooled cheese, which can trigger food poisoning. It also contains wine. In general, if you're not sure of the source, ingredients and alcohol content of a cheese fondue, avoid it while pregnant. Hard cheeses such as cheddar are generally safe for pregnant women. However, many classic cheese fondues use softer cheeses, such as Camembert, queso fresco, brie, white cheese or Roquefort. All of these run the risk of food poisoning, according to experts from the Colorado State University Extension. In particular, such cheeses can cause the bacterial infection listeriosis, which can result in damage to the child, including miscarriage. Though fondue heats cheeses to a high level, it may not be hot enough to kill off all bacteria. So, avoid cheese fondue when you don't know what types of cheese it contains. A serving of cheese fondue could contain around 1/4 cup of wine. Most fondue doesn't reach a high enough temperature to burn off the alcohol. The Centers for Disease Control and Prevention states that there's no "safe amount" of alcohol during pregnancy. So, although this is a relatively small amount of alcohol, you have no guarantee that taking it won't harm your unborn child. 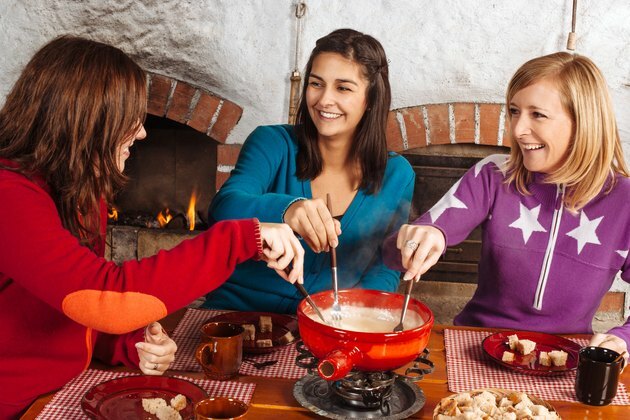 In particular, if you've chosen to have a small amount of alcohol as a drink with your meal, then fondue may increase the overall alcohol level. In some cases, cheese fondue is left out over many hours and heated and cooled as needed. This can increase the risk of bacterial contamination. The FDA suggests avoiding any foods left to cool uncovered and out of the refrigerator for longer than two hours. If you live in a climate with temperatures above 90 degrees F, throw food away after one hour left out, as bacteria tend to grow faster in such conditions. Cooled and reheated cheese fondue is, therefore, not suitable during pregnancy. Most cheese contains high amounts of the milk protein casein. Casein forms a sticky curd in your gut during digestion. In general, the human body finds it more difficult to break down than whey or other proteins. Though this might not be a problem under normal circumstances, during pregnancy, you're more prone to constipation. Eating large amounts of cheese could increase your chances of constipation. Exploratorium: "How Can I Keep My Cheese Fondue From Clumping?"